TOKYO (Reuters) -- Japan's Takata Corp. said it expects to return to profit this financial year on higher Asian and U.S. sales, but the troubled company made few provisions for possible costs related to a massive global recall of its exploding airbags. Around 25 million cars have been recalled worldwide since 2008 over Takata airbag inflators that have erupted with too much force, spraying shrapnel inside the car. Takata today forecast a net profit of 20 billion yen ($167 million) for the year through next March, on a 9 percent increase in global sales to 700 billion yen. The profit compares with a loss of 29.6 billion yen in the just-ended financial year, when the company booked a special loss of 58.7 billion yen ($489 million) mostly to cover recall costs. Takata's forecast factors in a 7 billion yen expense to cover legal and consulting fees, but does not include other costs related to recalls. "We are aware that there are risks but we are not able to reasonably calculate the potential cost so we cannot include them in our balance sheet or our forecast," Yoichiro Nomura, the company's CFO, told reporters at an earnings briefing. Six deaths have so far been linked to the defective component, all on cars made by Honda Motor Co., which announced disappointing profit forecasts last week citing high quality-related costs. Takata faces multiple class action lawsuits in the United States and Canada as well as a U.S. criminal investigation and regulatory probe. At the start of the briefing, Nomura and other executives bowed deeply and apologized to those affected by the recalls. U.S. regulators slapped Takata with a $14,000 per-day fine in February for failing to fully cooperate with a probe of its faulty airbags. Takata said it had allocated funds to pay the fine in the fiscal year just ended, but said it had not yet made any payments. Takata is working with experts, including scientists at Germany's Fraunhofer Institute, to determine the root cause of the airbag defects. The company said today the tests were continuing, adding it was unclear when the external investigation would be completed. 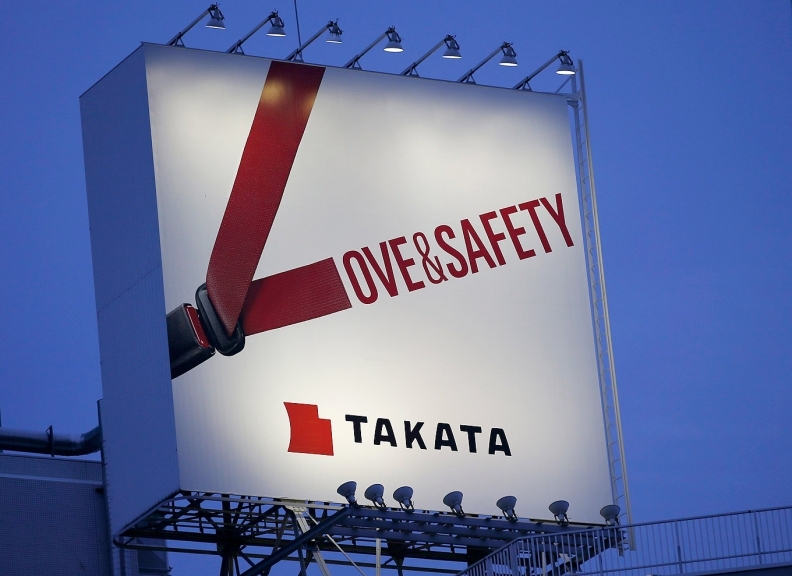 Separately, a consortium of 10 automakers led by Toyota Motor Corp. has also commissioned engineering firm Orbital ATK to conduct independent testing of Takata's airbag inflators.